On Sunday the US Ambassador to the UN, Nikki Haley, suggested that regime change was a prerequisite for peace in Syria. This position diverged from the president’s usual rhetoric, which has often conflated concern for human rights and nation-building with costly foreign adventures. Concurrently, Secretary of State Rex Tillerson emphasised that the defeat of the Islamic State (IS) is the government’s chief priority. President Trump has previously praised the Syrian and Russian governments for countering IS; Syria’s president, Bashar al Assad, is dependent on Russian aid and military support in his fight against various parties in Syria’s civil war. Following reports of Syria’s chemical attack on civilians in Khan Sheikhoun on 4 April, the US surprised observers by launching air strikes on the Syrian air force two days later. The move was seen as a bid to uphold international norms and restore US credibility. Although the US maintains that reducing migration and terrorist attacks are its chief objectives, increased assertiveness towards Russia’s surrogate in Syria could also be an attempt to refute accusations that President Trump is beholden to Russian interests. On 10 April, Reuters quoted a senior US official who charged that Russia knew of the 4 April chemical attack in advance. The official also stated that Russia had deliberately targeted a hospital where victims were being treated to destroy evidence that chemical weapons had been used. 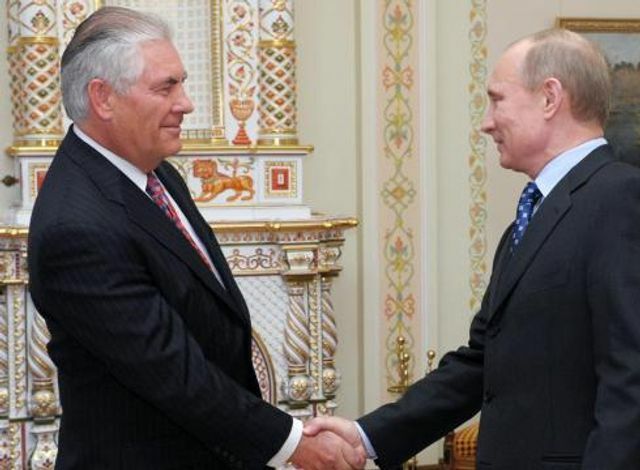 These disclosures will raise tensions during Mr Tillerson’s visit to Russia this week: a tentative audience with President Vladimir Putin was cancelled following the US air strikes. The newly minted diplomat, who received the Russian Order of Friendship in 2013, may also be aiming to publicly distance himself from Moscow. Ahead of his trip, he accused Russia of incompetence for failing to eliminate chemical weapons in its client state. Notwithstanding geopolitical tensions, the outlook for commercial risk in Russia remains unchanged by recent events. Russia will continue to regard international sanctions and criticism of its engagement in Syria and Ukraine as the cost of expanding its regional influence. Meanwhile, the US and its European partners will view sanctions against Russia as a rare point of unity amid ongoing disagreements over trade, migration and collective defence.